Welcome to the Toronto Stop on the Road Home Row-along! Today I join 4 other quilters who are blogging about what home means to them, as we participate in The Road Home Row- along. The Row-along, organized and hosted by Marian of Seams to Be Sew http://www.seamstobesew.com/ and Amy of Sew Incredibly Crazy http://sewincrediblycrazy.blogspot.com/, has 40 designers from all around the world, each creating a row reminiscent of their “home”. It started September 6 and runs for 6 weeks, with bloggers posting each Tuesday and Thursday. You are invited to collect as many rows as you want, and they are free! There are also tons of prizes – each blogger has a prize, there are weekly prizes, and also some grand prizes, so increase your odds of winning by visiting as many of the blogs as you can. Let me tell you about my row. I am a Toronto girl, born and raised here. While I now live an hour’s drive north of the city, I still travel into the city to enjoy all that it has to offer – world-class theatre, cuisine from every corner of the earth, top designer boutiques, professional sports teams (including World Series winner Toronto Blue Jays), world-renowned hospitals & universities, all crammed into the city. Despite that, it is a very green city. Toronto is on Lake Ontario, one of the Great Lakes, and our waterfront is a leisure playground, with lots of boating in the summer months. The best view of our spectacular skyline is from the Toronto islands, just offshore of the waterfront. Toronto is the biggest city in Canada, and our airport is the hub for air traffic to the US and overseas. How do I design a row reflecting these characteristics of my hometown? Each row is 12” by 24-40”. Now, if you’ve been to Toronto, you know that there is a special building (the CN Tower) that is iconic, and it is very tall – 1800ft! This meant that my row needed to be vertical. I am a piecer at heart, so I needed to include some of that. My row has storm at sea blocks to represent the lake. I used a selection of Northcott’s Toscana suede-like texture to create my row, including the range of clear blues for the sparkling water. The seams nested together because of the direction that they were pressed (2 opposing corners pressed in, and the other 2 opposing corners pressed out). 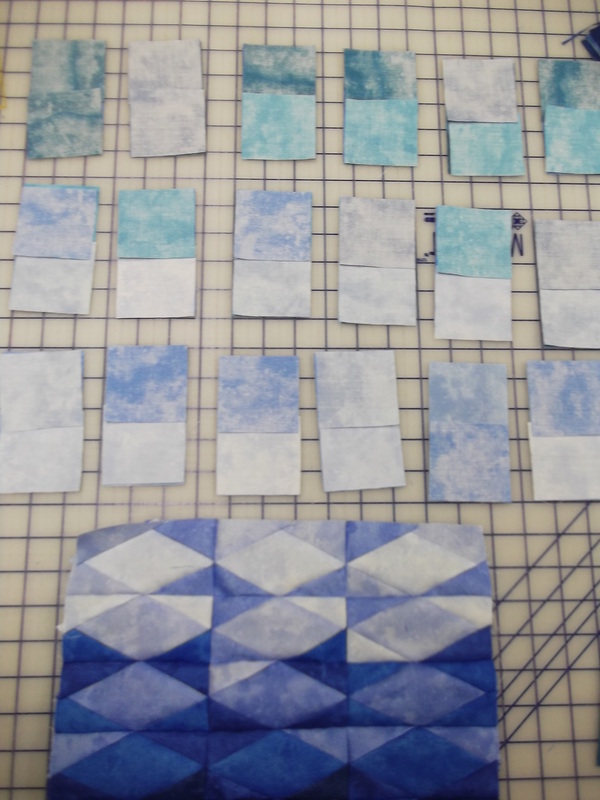 I selected warmer teal blues for the flying geese blocks to fill the sky. I randomly arranged them on my work surface, moving them around until I liked the color placement. 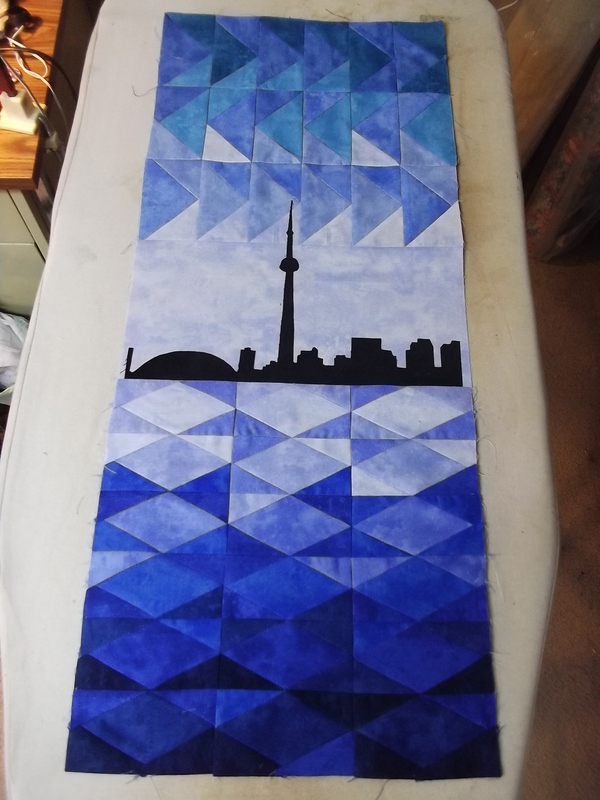 Then I sewed the sky to the lake, inserting the skyline background between the 2 pieced sections. Finally, I added the applique pieces that bring the row to life. 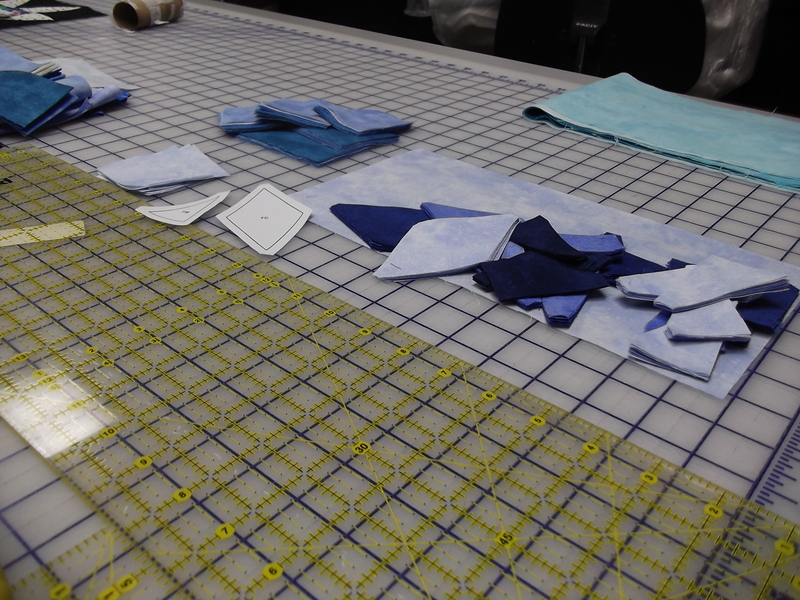 Here is my helper Susanne, preparing the applique pieces. She is in the Northcott sewing room (we are in the midst of Quilt Market preparations, so she is almost buried in projects). I hope you enjoyed your visit to Toronto. The free pattern for my row is available on Craftsy (Road Home Row-along Toronto) until the end of October. Marian and Amy have collected lots of prizes, so be sure to visit Marian’s site at Seams to Be Sew http://www.seamstobesew.com/ to enter for a chance to win a lovely 18” x 24” cutting mat from Calibre Arts or a fabulous embroidery disk from Anita Goodesign (embroidery is so popular right now!). These prizes are available for US residents only, so if you’re NOT a US resident, I have something for you too! For a chance to win a packet of Toscana fabrics like the ones used in my row, please leave a comment on my blog telling me where “home” is to you. I will collect entries until September 21st. Here is the full list of participants in The Road Home Row-along – have fun visiting as many as you can, and entering to win the prizes. Today is Labour Day, the official end of summer. It was a busy weekend at the lake, as many of our cottage neighbours packed away their summer toys. The lake is getting cooler – refreshing, especially in the morning, before the sun has had a chance to warm it. It is not yet too cool to jump into after my morning power-walk, and I am hoping to take advantage of some warm weather in the upcoming days to go for a few more dips before cottage season is over for another year. I took the opportunity to photograph my latest quilt on a couple of Muskoka chairs on the dock as the sun slipped past the trees. The chair colours matched the quilt quite well. Oddly enough, the lavender fabric in the quilt appears as blue, while the lavender chair is still lavender. Go figure! 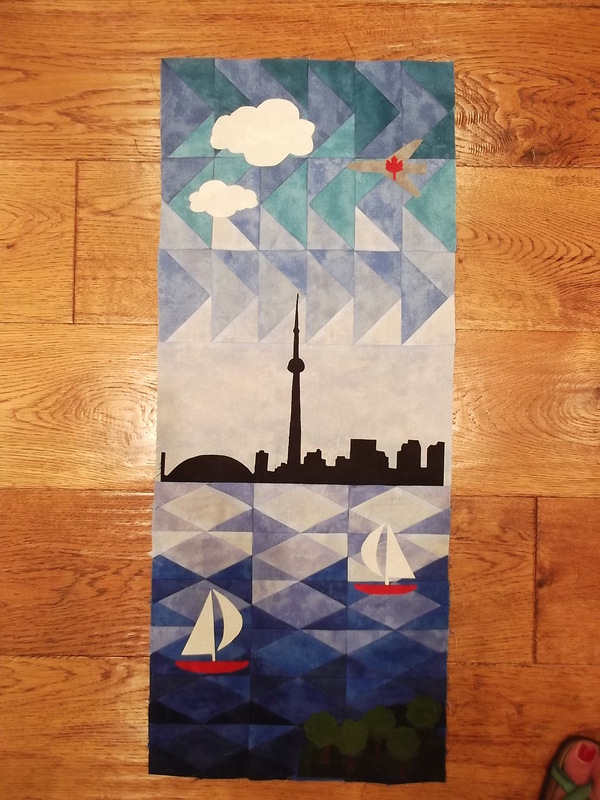 This quilt will be on display at the Simcoe County Quilt, Rug & Craft Fair September 16-18 at the Simcoe County Museum in Minesing, as part of the Barrie Modern Quilt Group’s display. I have been a member of the Barrie group for 3 years, and we have been invited to participate in the Fair this year for the first time. I am trying to get another small project done for the Fair, if the other items on my To Do list don’t take longer than expected (they almost always do). I was finishing the instructions yesterday to one of my new patterns – it is called Pine Grove, using Stonehenge Elements (shipping to stores next month). I used the Blue Planet colourway, so my pattern should probably have been called Spruce Grove. The wall-hanging-to-king-size pattern includes templates to cut the tree pieces, and I included instructions on how I prefer to cut the pieces when using the templates: I tape them to the underside of one of my many acrylic rulers, squares or triangles so that the angled edges of the template are aligned with the edges of the acrylic. No more trimming off extra bits of template when cutting the pieces! Here is the picture that I included in my pattern. Give it a try the next time you have similar templates to cut. Tape paper templates to the underside of a ruler and cut along edges of ruler to cut the pieces. This pattern is a variation of my Oh Christmas Tree pattern that I designed 5 years ago to use 2½” strip packs. I have had several requests to provide instructions for a king-sized version, so I included this size in the new pattern. It’s a great masculine quilt in the Stonehenge Elements, don’t you think? I also designed a quilt using Slate, the other colourway of Elements. Winter Solstice, originally made with Stonehenge Woodland, was published in McCall’s Quilting as Misty Pines. When Northcott’s Creative Director Deborah Edwards designed the new Elements collection, I think she had my quilt in mind, because it is a perfect fit for Winter Solstice. It appeared in the magazine as a lap quilt, and I have added a queen-size version to the instructions of the Elements version of Winter Solstice. Another great guy quilt! 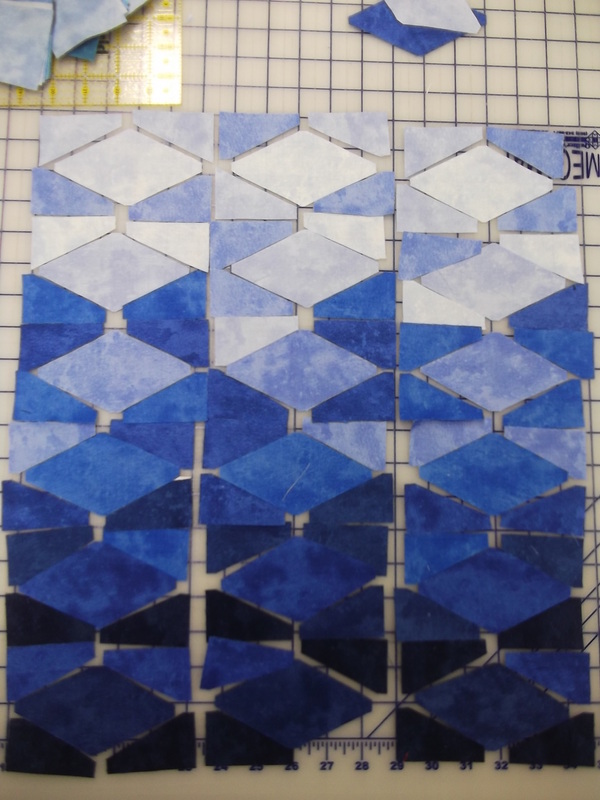 Next up on my To Do list is a row quilt that I am making as part of The Road Home Row-along and blog hop. My day to blog is September 15th, but the hop starts earlier, so please check it out. Here is a sneak peek at part of my row. 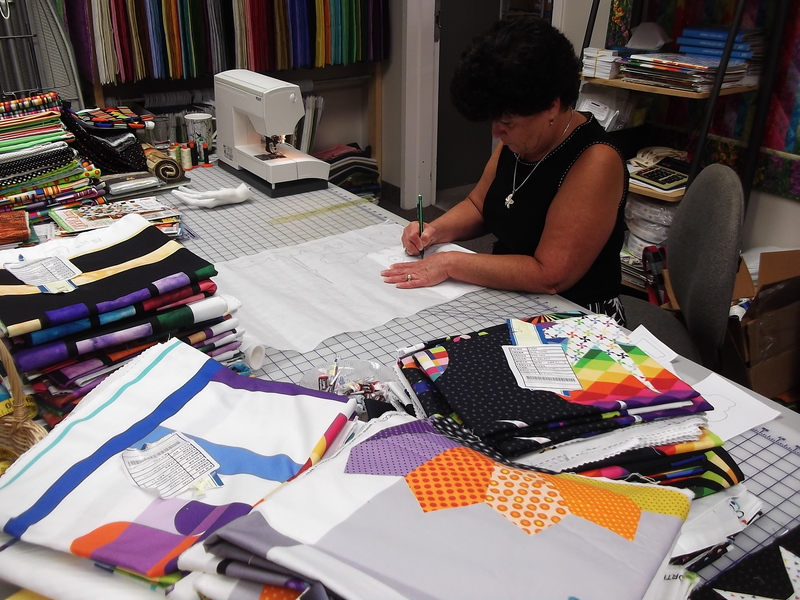 I have a few upcoming local trunk shows if you’re in the area – Lindsay Creative Quilt Guild on September 12th, Settler’s Village in Bobcaygeon on September 13th, The Quilt Store in Newmarket on September 15th, and the Georgina Pins & Needles guild in Sutton on October 4th. Time to get back to that list… see you soon!